Thrifty Clipper: Coupons, Wherefore Art Thou? So, you've decided to start your coupon adventure, but you are not sure where to get all those coupons. Fear not, as they are easy to find. Just open your eyes and L(.)(.)K! Ask your friends, family, and/or neighbors to save their newspaper/coupon inserts for you. If you travel (especially Sunday/Mondays) check with your motel front desk to see if they have extra unwanted newspapers/inserts. Ask you local coffee shop to save their newspapers/inserts for you (or offer to pick them up for weekly recycling). Sign up for Rouge magazine. (A FREE quarterly publication from P&G that contains beauty tips & coupons). Check inside product packages or for "peelies" located on the outside of the package. Look for "blinkies" when you are shopping at the store. Use a coupon clipping service or buy them on ebay. Sign up for company e-mails, newsletters, etc. They often send promotions and discounts to their "special customers." Take advantage of "Rewards" programs. Get a Rewards Card (aka shoppers card) at stores you frequent. Don't forget to sign up for their emails/special promotions! Become a Fan or "Like" them on Facebook. Thumb through those Valpak and Money Mailer envelopes you get in the mail. Not all of them are junk! If you have a local Clipper or Ad Pages magazine, check those out for coupons too! 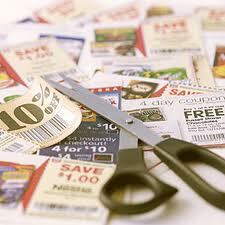 Know of other places to find money saving coupons? Leave a comment!